April 7, 2011 - by InterestingFacts.org - 3 Comments. Trees are something that can staggeringly grow to old ages. They can live much longer than any other animal or plant. As a matter of fact, many trees attain implausible longevity for a number of exclusive potentials. Some of these capabilities include the potential to replace lost or damaged organs, a sectored vascular system that helps some portions of the tree to stay alive irrespective of the fact that whether the rest of the tree is alive or not. Another reason for the long life of some trees is their potential to produce a clone shoot whereby an accessible shoot can generate a heritable indistinguishable offshoot. In Sweeden there is a Christmas tree, also known as a Yule tree which has root system that has been growing for 9,550 years (sometime around the end of the Ice Age). The actual offshoot of the tree is only 600 years old. Trees are really intriguing and very interesting organisms. 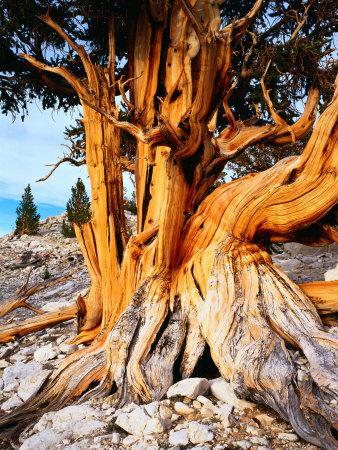 The oldest living-standing tree on earth is a bristlecone pine that is found in California, North America, and is believed to be over 4600 years old. Exact location of the tree is hidden since its old buddy “Prometheus” was cut down for “research” purposes. The age of the tree can be counted by counting the rings in its trunk. Some more trees that possess a long life are mentioned below: Prometheus: This tree, when cut, was approximately 4862-5000 years old. The tree was situated on the Wheeler Peak and was cut by a graduate student for the sheer purpose of his research. Methuselah: This tree is believed to belong to Pinus longaeva species of trees. This species is known for its enduring life. Sarv-e-Abarqurn: This tree belongs to the Cypress species of trees and is generally found in different countries of Asia, America, Australia, and Europe. Llangernyw Yew: This tree belongs to the Common yew specifies of trees and is found in Western, central, and southern Europe along with Asia and Africa. In this world of drastic changes and decay, trees are elegant beings, silent witnesses to all kinds of activity. So let us cherish them and promote them. Plant more trees. MAKE A DIFFERENCE. The California Redwoods have been overlooked in the list of long life trees. Sequoia Sempervirens and Sequoia Gigantum. They also qualify as the worlds tallest (semprvirens) and the largest (board-feet) is the gigantum. its really amazing informayions that show the greatness of our god.